In February, global equity markets rebounded from their January selloff, which was touched off by continued tapering of QE by the Federal Reserve, turmoil in emerging markets, and disappointing US economic data. Prior to the correction, equity market sentiment had been sky-high on what was viewed as and improving US and global growth outlook. So what triggered the equity rebound? Emerging markets concerns abated somewhat, although risks remain high in several countries. US economic data continued to disappoint but markets seemed to shrug the clear signs of slowing as primarily weather related. 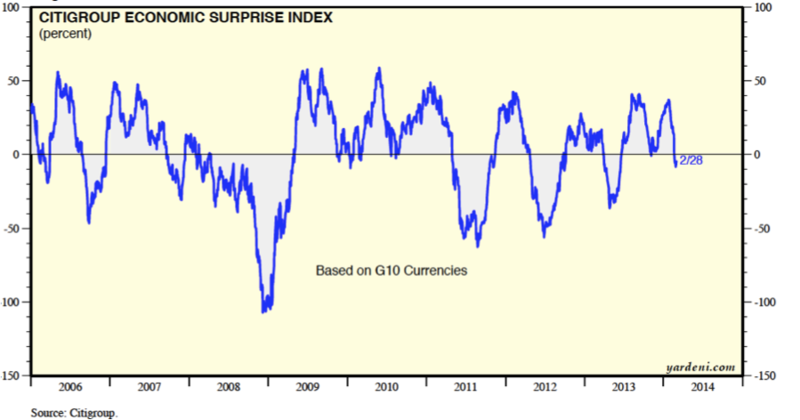 The Citi G10 Economic Surprise Index, which had surged into early January, fell back into negative territory by the end of the month. Janet Yellen took over as Chair of the Federal Reserve and the Fed continued on a steady tapering path, but markets remained comfortable that tapering does not mean tightening. Against this backdrop, the S&P500 recovered from its January dip to finish February at a record high. Energy prices rallied on frigid North American weather and geopolitical risk, as the WTI futures price rose to $103/bbl by February 28 from $98/bbl at the end January. Gold continued to rebound, as geopolitical risks increased and weak data suggested tapering would be gradual, with the price reaching $1329 at the end of February, up from $1240 at the end of January. Gold, the worst performing asset in 2013, is the best performer in 2014 to date. With crude oil, gold and natural gas prices all strengthening in in February, the Canadian dollar firmed a bit after its sharp drop in January. The Fed’s decision to proceed cautiously with tapering, combined with the Bank of Canada’s concerns about downside risks to inflation, tempered the Canadian dollar’s response to stronger energy and gold prices, with the C$ rising 0.6% against the US$ in January, as USDCAD fell to 1.1064. Stabilization of EM turmoil, continued weak (weather-impacted) US economic data and continuity at the Fed generated positive returns for most all classes in February. The S&P500 recovered its January loss, closing February at a record high 1859, up from 1783 at the end of January and 1842 at the end of December. Global equity ETFs posted positive returns in February. Most major markets gained in local currency terms and, despite the firming of the C$, Canadian investors saw solid global equity performance in CAD terms, which included the Eurozone (FEZ), which returned 5.9% in CAD terms, US (SPY) +4.0%, Canada (XIU) +3.9%, Emerging Markets (EEM) +2.8%, and Japan (EWJ) +1.9%. US small caps (IWM) returned +4.2%, slightly outperformed US large caps in February. Commodity ETFs performed well. The Gold ETF (GLD) returned 5.7% in CAD terms, while the GSCI commodity ETF (GSG) returned 4.2% as commodity price strength outpaced C$ firming. Most Global Bond market ETF returns added to their January gains, with EM bond ETFs outperforming DM bond ETFs. Canadian bonds (XBB) returned +0.4% in February. Non-US global government bonds (BWX) posted a return of +1.7% in CAD terms. Emerging Market bonds outperformed in February as USD-denominated bonds (EMB) returned +2.9%, while EM local currency bonds (EMLC) returned +2.4% in CAD terms. The weakest performance came from US bond ETFs which hurt Canadian investors as the C$ strengthened. US long bonds (TLH) returned -0.03% in CAD terms. Inflation-linked bonds (ILBs) posted mixed returns in February. Canadian RRBs (XRB) returned +0.4%, US TIPs (TIP) returned -0.1% in CAD terms, and non-US ILBs (WIP) returned +2.3%. US investment grade (LQD) and high yield (HYG) bonds posted positive returns in CAD terms, returning +0.6% and +1.7% respectively. Canadian corporate bonds (XCB) returned +0.5%. 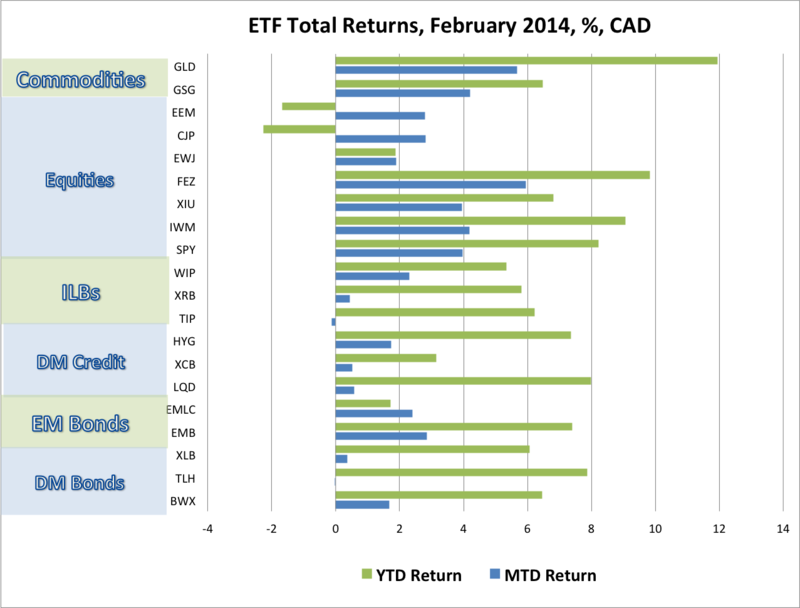 In February, Canadian ETF portfolios posted solid performance, adding to the January gains. The traditional Canadian 60% Equity/40% Bond ETF Portfolio gained 3.1% in February to be up 4.1% year-to-date (ytd). A less volatile portfolio for cautious investors, comprised of 45% global equities, 25% government and corporate bonds and 30% cash, returned 2.2% in February to be up 3.4% ytd. 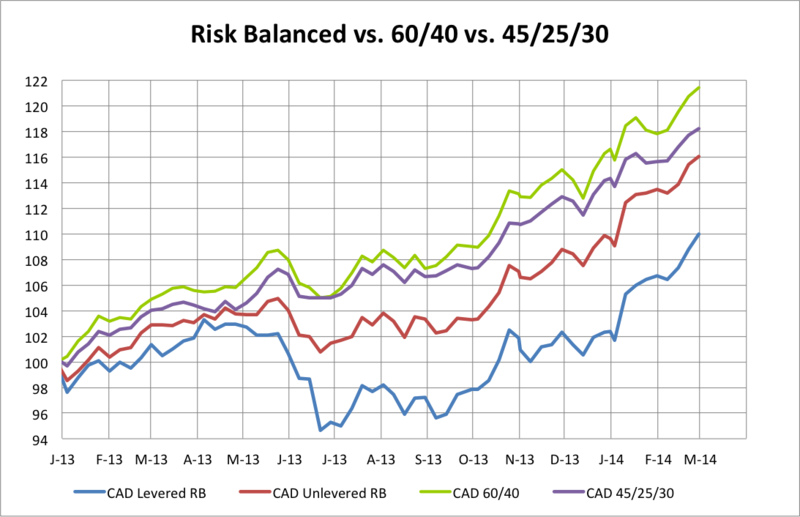 Risk balanced portfolios, which performed well in January, added to their gains in February. A Levered Global Risk Balanced (RB) Portfolio, which uses leverage to balance the expected risk contribution from the Global Market ETFs, gained 3.1% in February, bringing its year-to date gain to 7.5%. An Unlevered Global Risk Balanced (RB) Portfolio, which has less exposure to government bonds, ILBs and commodities but more exposure to corporate credit, returned 2.3% in February to be up 5.8%ytd. February turned out to be a rebound month after global equity markets suffered a significant sell-off in the last two weeks of January. Equities, bonds, I-L bonds and commodities all posted gains in February as concerns about turmoil in emerging markets abated somewhat and Janet Yellen reassured markets that the Fed would slow the tapering if the economy slows. · The Winter Olympics detracted traders’ attention from unsettling developments in Ukraine through mid-February. After the athletes returned home, however, violence in Kiev forced President Yanukovych to flee to Russia. As the month drew to a close, Russia ignored US warnings and approved military action to protect its interests in the Crimea. The situation poses a significant geopolitical risk to markets in early March. · The Bank of Canada announces its policy rate decision on March 5 and is likely to restate that the direction of the next rate move will depend on uncertain growth and inflation developments. The Canadian economy grew at a solid 2.9% pace in 4Q13, but mix of growth was unfavorable with weak domestic demand and inventories making a large contribution to growth. In addition, December GDP fell by a larger-than-expected 0.5%, raising the odds of a sharp drop in growth in 1Q14. · Over the past month, US economic data have been weak, but much of the weakness has been shrugged off by markets as merely weather related and, therefore, temporary. However, some of the weakness probably reflects payback for a surge in activity in late 2013 and unusually cold weather continued right through January and February. It is quite possible the economic data will remain weak right through March. The optimism about a rebound in global manufacturing activity has dimmed. · Concerns about falling global inflation continued, with the G20 meeting backing away from austerity and calling for policies to boost growth and return inflation to target. Recent global inflation readings have been a bit firmer, but disinflation concerns remain and will grow if the soft growth data persist. · Despite some recovery in February, emerging markets remain a focus in financial markets. Financial conditions have tightened meaningfully in EM countries and very sharply in countries like Turkey and Brazil. China's growth continues to slow as the People's Bank of China attempts to slow runaway credit growth and the housing market shows signs of cooling. In a mid-January post on Inflation and Deflation Scenarios, I pointed to Russell Napier’s advice to watch inflation expectations (measured by US 5-year TIPs break-evens), copper prices and credit spreads. Since that post, these indicators have moved modestly, but not decisively, toward the outcomes consistent with the deflation scenario. The continued rally in sovereign bonds reflects a combination of weak growth, weak inflation and geopolitical risk. As it turned out, the equity market did rebound by the end of the first week of February to hold support and subsequently rose with theS&P500 setting a new record high on February 28. The rebound reflects a view that recent signs of economic weakness will melt away with the return of more normal weather this spring. China’s credit bubble and political instability in Ukraine remain as downside risks to the global outlook. January’s equity market correction reduced the excessive optimism that prevailed in early January, but equity valuations remain just as stretched now as they did then. In mid-February, we put a little cash to work in US$ denominated EM bonds (EMB), as EM sovereign US dollar debt spreads became more attractive. However, we continue to favor a relatively cautious stance. Until we have more clarity on geopolitical risks and the trend of global growth and until disinflationary pressures show signs of abating, the direction of markets in 2014 remains highly uncertain. Having ample cash in the portfolio remains a good strategy, as opportunities to buy either equities or bonds at significantly lower levels later this year still seems like a good bet.